Spicy World Zinc Oxide is FDA certified and it is of pharmaceutical grade. Spicy World Zinc Oxide is used in soaps, lotions, lip balms and other skincare and cosmetic products. It is organic and natural in Composition. 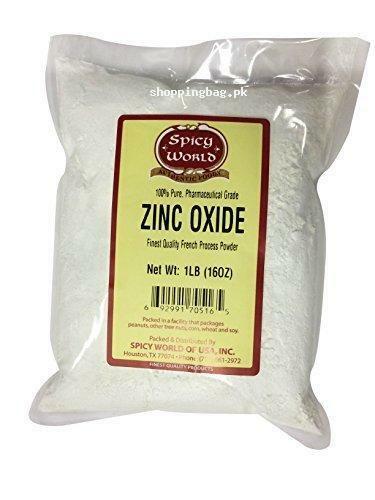 You can find Spicy World Zinc Oxide in Amazon imported products in Pakistan via online shopping in Pakistan. Spicy World Zinc Oxide provides marvelous value to you in reasonable price. Place your order and get this high quality product at your doorstep anywhere in Pakistan. Spicy World Zinc Oxide is composed from French processing method which will give perfect powder texture. Buy Spicy World Zinc Oxide and enjoy online shopping in Pakistan. Our Zinc Oxide uses the "French Process" - which is a method of pulverizing Zinc Oxide developed in 1845 in France by LeClaire. Most of the world s zinc oxide is made by using the French Processed method and our Powder is no different. Our Zinc Oxide Powder is Made in the USA in an FDA Certified Facility and it is Pharmaceutical Grade, which makes it as pure as possible. Please note it is packaged in a facility that packages our tree nuts, peanuts, soy, and wheat products.